Master Muhammad, his family and wives (the mothers of the believers) and his descendants and companions. May Allah's salutations and peace be upon all of them, for as long as He is remembered by those who remember Him and by those who forgot to remember Him". "Oh, you who have attained to faith! Remember Allah with unceasing remembrance, and glorify Him morning and evening. He it is Who sends salutations on you, as do His angels, that He may bring you out from the depths of Darkness into Light: and He is Full of Mercy to the Believers.Their salutation on the Day they meet Him will be "Peace!" and He has prepared for them a generous Reward" (Holy Qur'an 33:41-44). Allah says in a Hadith Qudsi: "Whoever is hostile to My saints, I declare war upon him. And My slave does not come close to Me with anything more beloved to Me than what I have made obligatory upon him. My slave continues to come nearer to Me through voluntary deeds until I love him, and when I love him, I become his ears with which he hears, I become his sight with which he sees, I become his hands with which he strikes, I become his legs with which he strides. If he asks Me, I shall surely grant his request. If he seeks My refuge I shall protect him. I do not hesitate in what I intend to do, as much as I hesitate to take the soul of My faithful slave; he hates death while I hate for any harm to come to him" (Sahih Bukhari). The great saint of Islam, Imam al Junayd has said: This teaching (tasawwuf) is based on two witnesses, the Holy Qur'an and the Sunnah of the Holy Prophet Muhammad . If your unveiling (kashf) is in contradiction to either of these, you must abandon your unveiling and hold firm to the Holy Qur'an and the Sunnah. Our great Shaykh Ibrahim ad Dasuqi put the meaning of the Way (Tariqa) very simply: 'You should know your Lord and worship Him. Whoever accepts this, he has indeed understood and reached the realities of both the outward and the inward (shari'a and haqiqa)'. All praise is due to Allah, the One through whom all success can be attained; and endless salutations upon the seal of Prophethood and Messagehood and never-ending gratitude to my beloved Allah, for the grace and baraka to make available to all the spiritual children of our Shaykh and Imam Muhammad 'Uthmaan 'Abd al Burhany (may Allah sanctify his secret), the transliteration and translation of the Awrad of the Tariqa Burhaniyya-Dasuqiyyah-Shadhuliyya. Contained within this Awrad are the means to travel the oceans of Unity and reach illumination, as our Shaykh Ibrahim ad Dasuqi said: 'My aim for all of my children is that they become people of 'taste', not people of 'description' and that they take their knowledge from the Divine Source'. Allah will give the one who completes himself in a state of knowing the inheritance of divine knowledge without intermediary. 1. 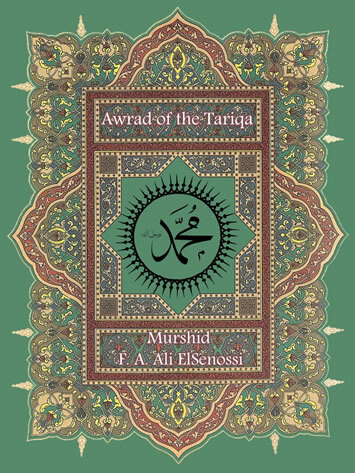 None of his murids may belong to any other Order. 2. None are to have the wrong doctrine [defects in their beliefs (aqidah)]. 3. All are to faithfully recite the Awrad. Order and the baraka contained within it by the Grace of Allah. What is in this Awrad? The Holy Qur'an, Allah, His Names, His Attributes and His Actions; and an abundance of salutations upon the beloved of Allah, Muhammad Ahmad al Mustapha , the final Prophet and Messenger of Allah to all creations. He is the one who said: "The best that I and all the Prophets before me have brought is 'La Ilaha il Allah', 'There is no gods, only Allah'. In the Holy Qur'an the beloved Allah has said to us: "Say: 'Allah': Then leave them to plunge in vain discourse and trifling" (Qur'an 6:91). Muhammad , to accept this small effort; to conceal any faults contained within it and to give success to all who practice and follow the way of Muhammad, the Messenger and the Mercy to all creations . Wa ma tawfiq illa billah. (And success is only by Allah). Wa huwa hasbi wa ni'amal wakeel. (And He is my protector and the best of trustees).